These vibrant and colorful Universal Spirit / Interfaith Flags make a wonderful statement of hope for our world by embracing nine different world faiths. 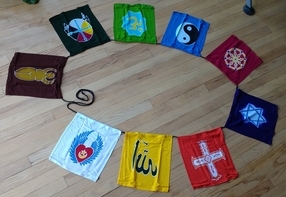 The Universal Spirit / Interfaith Flags are a series of nine flags that include the following religious symbols: Great Goddess, Native American, Hindu, Taoist, Buddhist, Jewish, Christian, Islamic and Sufi. Each flag on the string measures 10” square and is sewn on a black cord approximately 9’ in length. Combine with a string of Multifaith flags for a total of 18 faiths!